Reading and share top 10 famous quotes and sayings about Lesser Of Two Evils by famous authors and people. 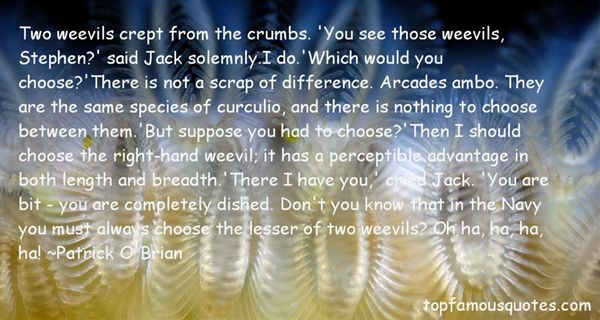 Browse top 10 famous quotes and sayings about Lesser Of Two Evils by most favorite authors. 1. "I'm just deeply disappointed that once again we may have to settle for the lesser of two evils." 2. "Voting for the lesser of two evils is still voting for evil. Next time, why don't you go all out and write in Lucifer on the ballot?" 3. "Constantly choosing the lesser of two evils is still choosing evil." 4. "The lesser of two evils was still evil." 5. "When you choose the lesser of two evils, always remember that it is still an evil." 6. "If it feels like you're choosing between the lesser of two evils, don't. 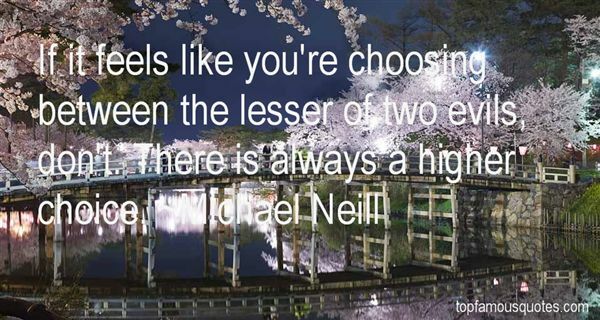 There is always a higher choice." 7. "Two weevils crept from the crumbs. 'You see those weevils, Stephen?' said Jack solemnly.I do. 'Which would you choose? 'There is not a scrap of difference. Arcades ambo. They are the same species of curculio, and there is nothing to choose between them. 'But suppose you had to choose? 'Then I should choose the right-hand weevil; it has a perceptible advantage in both length and breadth. 'There I have you,' cried Jack. 'You are bit - you are completely dished. Don't you know that in the Navy you must always choose the lesser of two weevils? Oh ha, ha, ha, ha!" 8. "I think voting for the lesser of two evils in game theory always leads to more evil." 9. 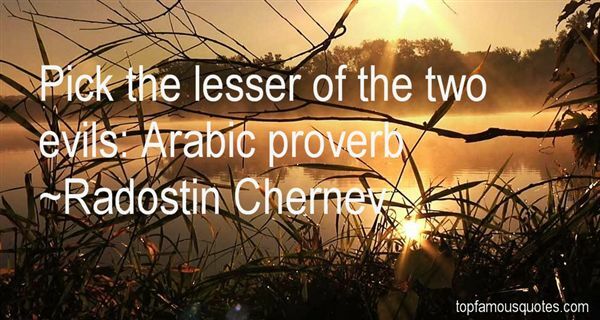 "Pick the lesser of the two evils: Arabic proverb"
10. "If you have difficulties making a decision, choose the lesser of the two evils." Instead of stocks investors should invest in blankets, that way they'll at least have something to keep them warm after they've lost all their money when the company goes under."